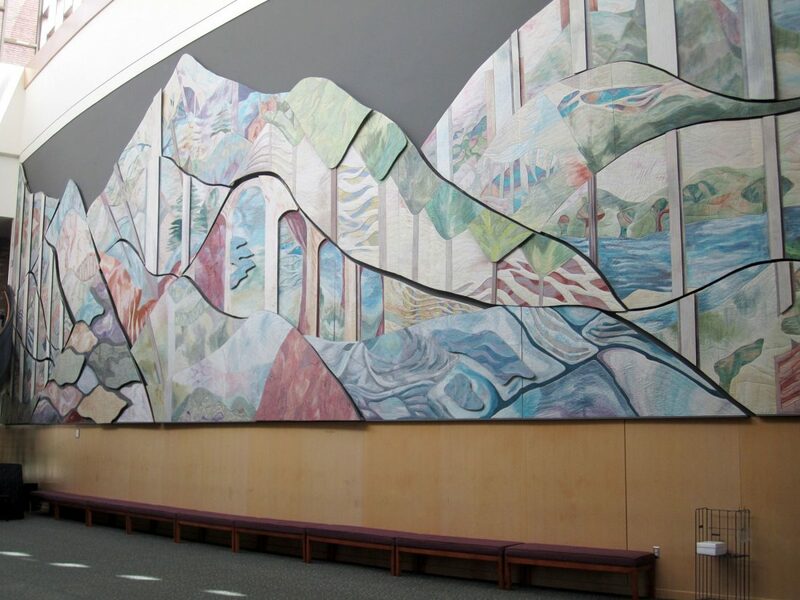 Visitors to the Vern Riffe Center are immediately greeted by “Road to Discovery” by Pamela Matiosian, the massive mural which graces the wall of the Selby Lobby. People are amazed when they learn the mural is made of paper and silk, but it is true. The paper handmade Japanese kozo paper, constructed of mulberry fiber and then hand painted. The silk is also hand painted and then the pieces are quilted and laminated on to a wooden base which is mounted on the wall. The mural evokes the shape of the hills of Kentucky that you would see across the Ohio River if the wall weren’t there. Completed in 1996, the mural was funded through the Percent for Art program of the Ohio Arts Council.